AREN'T YOU TIRED OF LIVING EVERY DAY WITH NECK PAIN? This "Air Cervical Neck Brace" is A LIFE SAVER. 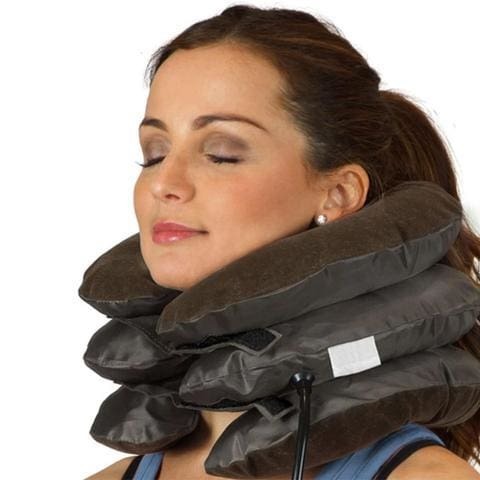 It is designed to support the neck, elevate jawbone and relieve tension in muscles. SMALL ENOUGH TO TAKE ANYWHERE: No matter where you are on stiff days, experience spinal traction at home or on the go. It’s soft, lightweight and small enough to fit in your suitcase, purse, car or backpack. INFLATABLE FOR MAXIMUM COMFORT: this cervical pillow is easily adjustable so you can control the amount of air for a comfortable spinal stretch to relax your neck and shoulders. Should fit comfortably up to 17.5" neck size. FAST NECK PAIN RELIEF - Provides fast neck pain relief, and faster recovery from neck injuries. Relieves neck pain for anyone suffering from neck arthritis, herniated/bulging disc in the neck, neck strains and cervical muscle spasms. INCREASES BLOOD CIRCULATION - The cervical traction device helps by increasing blood circulation to the structures of the cervical spine, helping to oxygenate muscles, nerves, tendons, thus decreasing pain and promoting relaxation. CORRECTS NECK POSTURE - Keeps your neck in a perfect posture allowing it to heal and prevents further neck injury and pain. You can do neck traction at home just as effectively and safely. Fits the description of goods, delivery fast, thanks to the recommended. Arrived 15 days after order and well packed, Thank You! Dressed, sit waiting for the results. Thank You pillow as pictured, consistent with the description. A great thing! Keeps your neck, the giving bend back. Super Fast shipping!!! Good quality for the price. Everything is inflated. If the effect of the later will add a review. Good quality and very fast delivery. The Only Thing that confuses me is the size. I AM not sure that it will be comfortable, because it is. The Chinese are all make the teenagers, rather than adults. Seemed inner circle small, afraid that such pillow will choke during flight. but until you try could not approve. Everything is fine. Fits the description of goods, seller recommend. Thank you all! 5 out of 5. The cushion no complaints, all as a description, see as manifest themselves in the process. It has long been shipping ukrainu 33 days, but thank God got, and happy!!! !